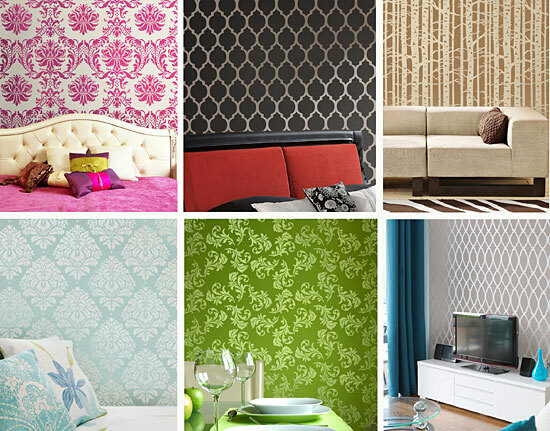 Damasks and Allover stencil patterns! So trendy, so hip, so modern… So tempting! But can it actually be done? Especially, if one has never stenciled before? Well, it certainly can be done. It’s not even that difficult! In fact many, many of our customers who are stencil newbies did it and got unbelievably beautiful results. 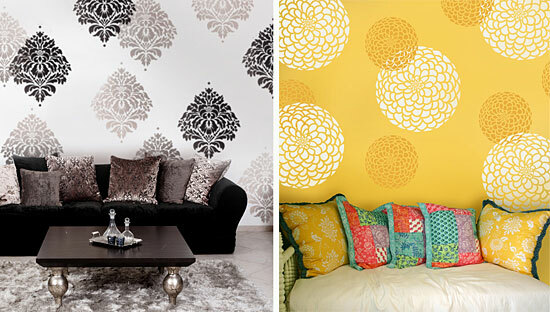 Which proves that stencils are a perfect tool for DIY decorators. 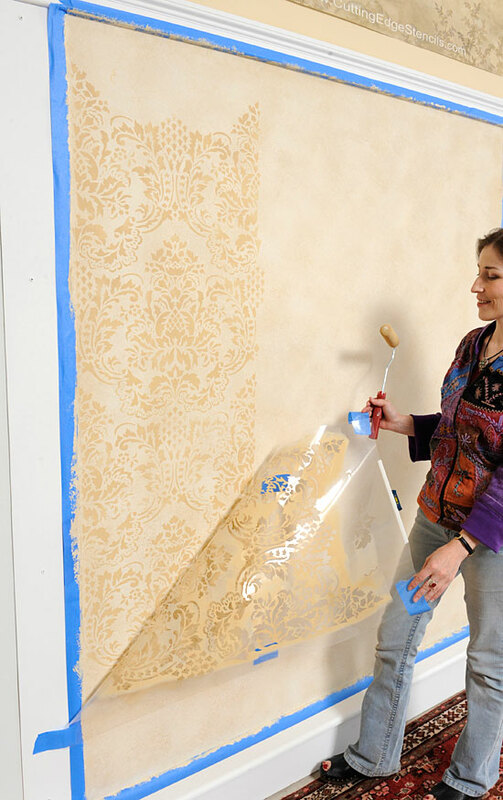 Once you get over that fear of making your first stencil print and see how easy it is to align the stencil seamlessly, you’ll quickly gain confidence and will be a damask stencil pro in no time. In fact, you may get addicted to stenciling, many sure did :) Take a look at these beautiful works of stencil art produced by our customers, most of whom are first time stencilers! But, as always, there are few tips and tricks to learn! 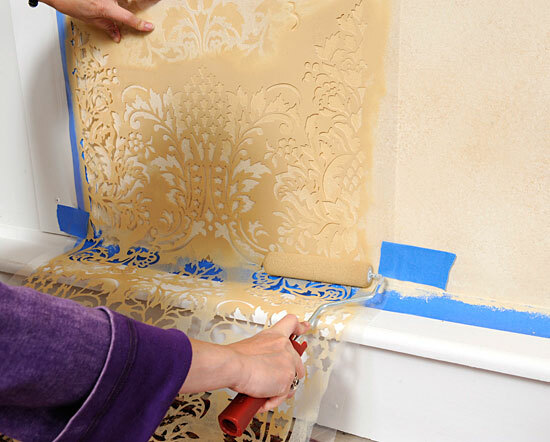 And there are some do-s and don’t-s, so let’s take a closer look at Damask stenciling. First I must say, that this type of stenciling requires some patience: after all you’re covering your entire wall or even all 4 walls in stenciled pattern. So please don’t expect to finish it all in 1 hour, it just isn’t happening! Give yourself a day or a even weekend to complete a large project like this. A small to average size accent wall can be done in 2-8 hours, depending on your skill, complexity of the pattern and your color choices. Some people are very fast at this and some are naturally slower. It’s always easier and faster to use close colors rather than contrasting colors. 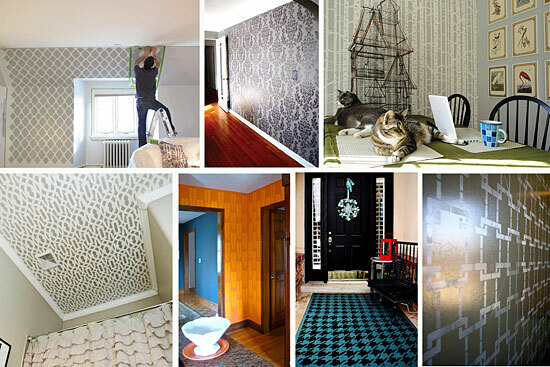 Some stencil patterns require more time than others because of the design: patterns with bigger openings tend to take longer. Stenciling is much more forgiving when done over faux finish like sponging. Also, some prior stenciling experience will definitely be a plus. I always recommend for a newbie to start with a single stencil design, like a Tree branch, Peony blossom, or at least an allover motif that doesn’t require alignment, like a Zinnia Grande stencil or single brocade stencil (Kerry LG Scale Damask) which you simply place by eye here and there. A simpler project like this will go much faster, too. 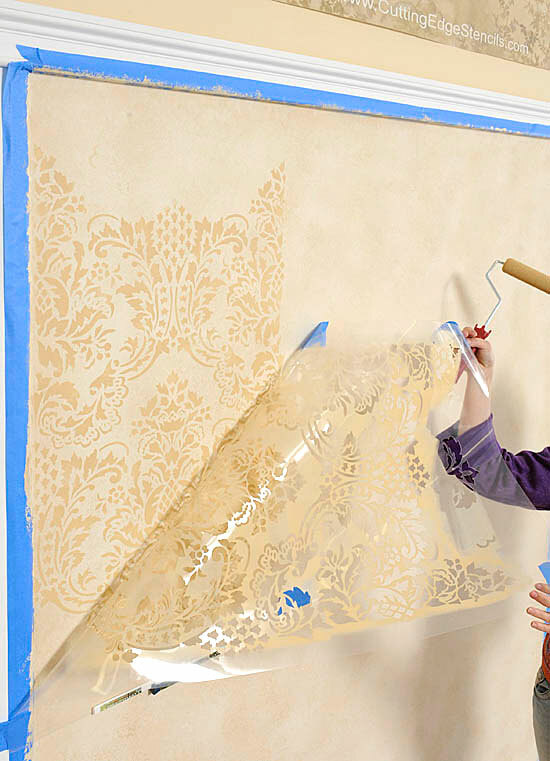 If you are a stencil newbie but you want that damask BAD, (and I totally understand why you would), then at least do yourself a favor and start with a single wall, also called feature or accent wall, instead of attempting to do an entire room as your very-very first stenciling project. By the way, accent walls are all the rage now and you can get a trendy look in just a few hours… It’s always better to start small and be successful than get frustrated with a large complicated project. Please invest some time into figuring out your colors and practicing the technique on a board or on a wall in the garage. Make sure you like your selected colors, take a look at them during the daylight and under electric lights, they may look totally different! Get comfortable with the technique, get the feel for the right pressure on a roller and the right amount of paint. Couple of test prints is all you need, but it’s an important step. I talked about the roller stenciling in detail in one of the previous posts. If you’re doing an entire room, It is smart to start with the least visually “important” wall, like the corner above a door or top left corner on the wall. This gives you an opportunity to work out your technique in a less conspicuous area. 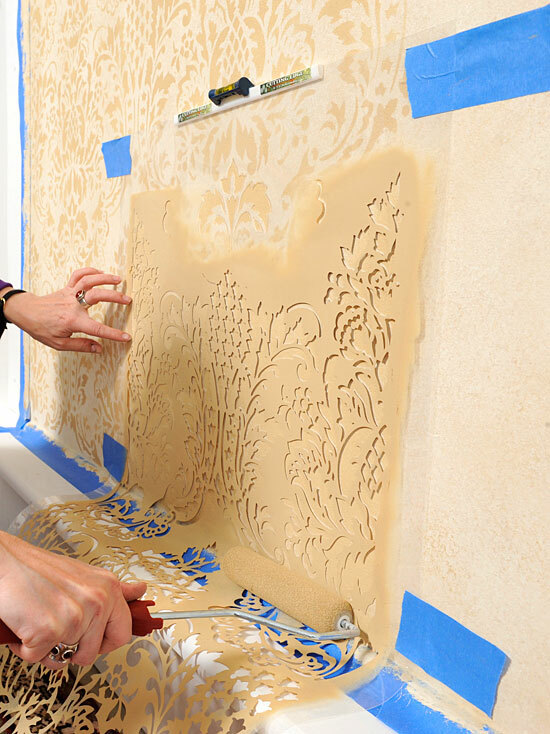 By the time you reach a focal point wall, you’ll be very comfortable with your stenciling technique and your stenciling will look great. For an Accent/Feature wall, it’s smart to start on a section of the wall that allows you to do un-interrupted floor-to-ceiling row of the pattern. This way you establish a perfect vertical pattern from which to extend left and right. Let’s mask all the trim and ceilings with 2″ blue painter’s tape. 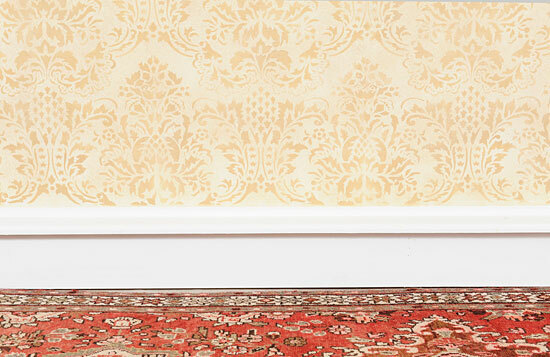 If you’re stenciling just the accent wall, mask out the other walls to make sure the corners stay clean. 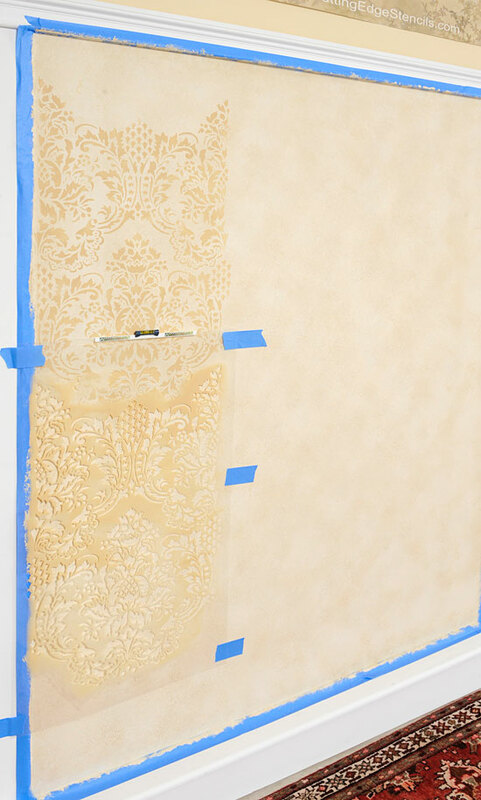 OK, Position your damask stencil on the wall and secure it with 4-6 pieces of low tack blue masking tape. 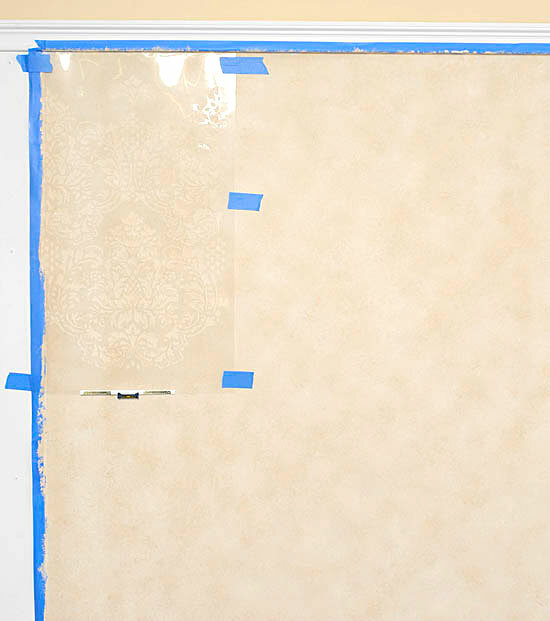 Don’t bend the stencil, just place it flat on the wall and tight against the ceiling crease. There will obviously be some gaps left from the stencil frame, but we’ll take care of them later. Let’s stencil the “easy” space first and then deal with edges in the end. Do not use regular white masking tape as it is way too sticky for most painted surfaces and will likely pull off the base paint when you remove your stencil. With stencils, you can use a spray adhesive to achieve even cleaner edges, and you should if you’re using contrasting colors. I personally don’t like adhesive, but it can be very helpful especially for a newbie. Your edges will be definitely crisper with adhesive. All spray adhesives do work, but Elmer’s seem to be the best. How to make sure the stencil is level? Sure, you can use the traditional bubble level, laser level or even a pre-historic plum-bob on a string, but we’ve got a much better alternative: our innovative Clip-On Stencil Level! It will make the leveling job a snap. Clip it to the stencil (top or bottom straight edge), make sure it sits tight, and check that your pattern position is level. Correct your positioning if necessary. Our clip-on level is light weight and can stay on the stencil during the entire project and will help you to correctly position each imprint. Now pour some acrylic or latex paint onto a foam plate or into a paint tray. 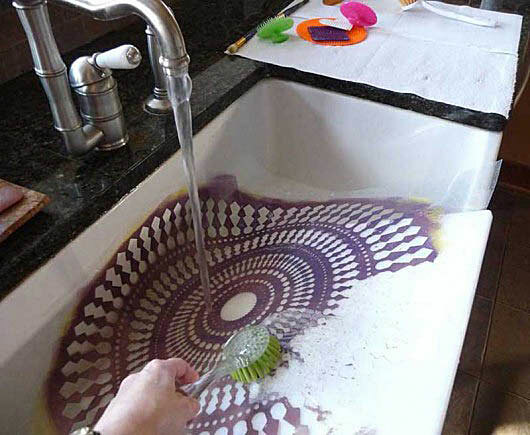 You don’t need much, about few tablespoons ( a small puddle) of paint is enough to start with. Here we used Benjamin Moore Regal in color #1069 in flat. Our background finish – Sponging of 1069 and Navajo white, the technique was described in detail in the previous post. We found that Benjamin Moore “Ben” paints work really well with stencils, they are also economical. Load your foam roller by rolling it over the paint a few times until it absorbs most or all of it. Use only dense foam rollers with rounded edges. Regular fluffy paint rollers of soft foam rollers are not good since they hold too much paint. Now blot off the excess paint on a folded paper towel by rolling it back and forth a couple times. There should be no visible paint on the roller surface. It should look almost dry. Remember, for stencils it’s better to have less paint in your roller, than too much paint! Roll the stencil with your roller using light to medium pressure. If you press too hard the paint may bleed under the stencil, so avoid the temptation to press hard. It’s better to quickly build coverage in few light short back-and-forth strokes, than to press hard once and get the paint under the stencil. If you want a solid paint coverage, make sure that you applied an even coat of paint on entire stencil design before removing it. If you want a broken, “barely there” or “aged distressed” look, then do an “imperfect” rolling , leaving some areas barely touched with your roller and some fully coated. Be careful not to roll over the outside edges of the stencil. We design most of our stencils with at least a 1” frame to give you some rolling room. Also, strategically placing strips of blue masking tape on the narrowest edges can help prevent “roll-overs”. If this happens, quickly wipe the mistake off with a moist baby wipe. 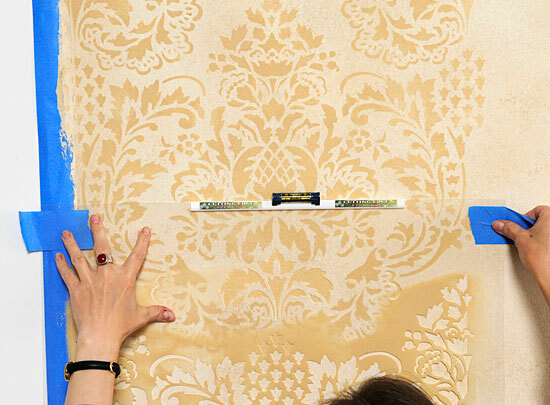 You can easily check how you’re doing by carefully un-taping and lifting one corner of the stencil and taking a peek. Does it look good? Are you happy with the coverage, or is it too light? If it’s too pale, or uneven, just put the stencil back and roll it a couple more times back and forth, slightly adding more pressure. 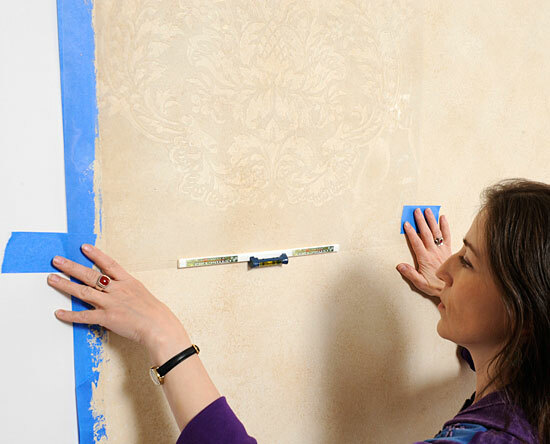 When stenciling lighter colors over darker colors, you may need 2 coats to achieve good coverage. Let the 1st coat dry for a couple of minutes and then roll the stencil again. When you are done with your first print, un-tape and remove the stencil. Looks great! The damask print is nice and crisp and I didn’t even use any spray adhesive! With some patterns you may get more seepage then with others, it’s just the way the design works. Also, similar colors are much more forgiving than contrasting colors. That’s why I recommend doing a test first and deciding if you’ll need a spray adhesive or not. Please understand that with stenciling some minor paint seepage here and there is inevitable, especially if you’re using a roller. 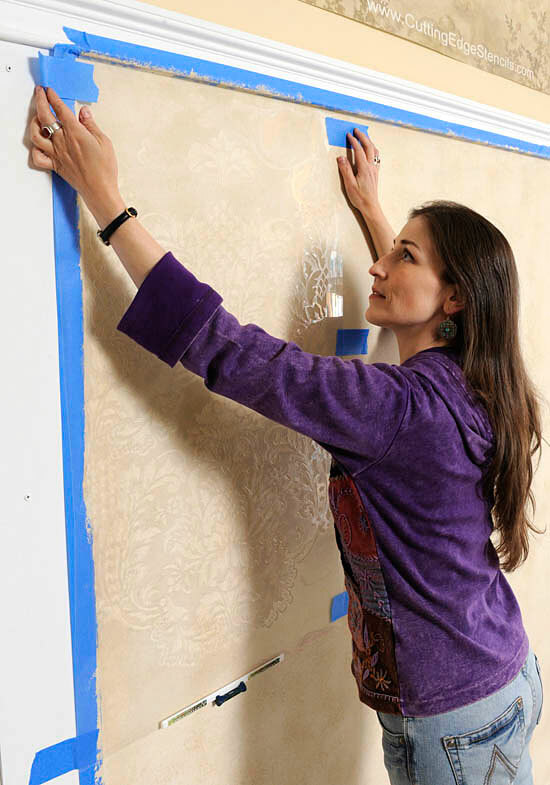 You can eliminate the seepage and get really crisp edges if you’re using a stencil brush, but it takes so much longer to stencil an allover damask wall with a brush. The truth is, once you step a couple feet away from your wall, your eye will not notice any seepage! So I personally don’t sweat it, and I hope you don’t either. Remember, you are creating a hand painted wall finish, which is almost like art and can’t be too perfect. …and let’s reposition the stencil right below the finished print. Our allover stencils lock in with themselves. Use the parts of the design as your registration marks and make sure the elements of the previous print and the stencil line up. We like this simple interlocking system, it’s so intuitive and easy to use. It’s a very easy registration system, which we used for years as decorative painting professionals. It’s way better than old-fashioned cumbersome and slow rectangular “registration marks” system (which I totally dislike). Also, this way stenciling goes much faster, it’s more accurate and easy. You’ll instantly see which previously painted parts of the design to use to lock-in the stencil.The only time it can be a touch tricky is when you’re using very, very close colors because it may be a bit hard to see previously stenciled parts. Here I am aligning my next repeat with this previously stenciled leaf. We never wait for the previous repeat to dry, somehow it has never been a problem and smudging doesn’t occur. If you’re stenciling over a Flat basecoat, which we recommend, you should have no problem with this, since flat paint is porous and absorbs the paint rather quickly. By the time you start repositioning, the previous repeat is usually almost dry. 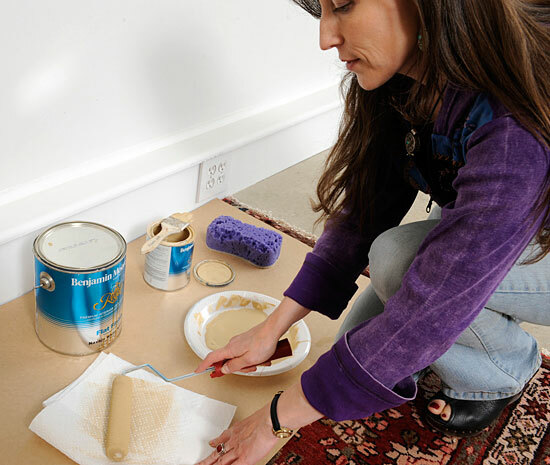 If you’re stenciling over less absorbent satin or semi-gloss basecoat or if you’re using contrasting colors, then may be give it a minute to dry before re-positioning to prevent any possible smudging. And if a minor smudge occurs, don’t panic -you can quickly touch it up later with your basecoat paint and a small brush. OK, let’s tape the stencil in place, check the level and continue stenciling. I prefer to work in vertical rows, placing each stencil repeat right under the previous one. Some people prefer doing horizontal rows, I guess it’s up to you. The bottom edge (by the baseboard) gets done with the last stencil repeat. 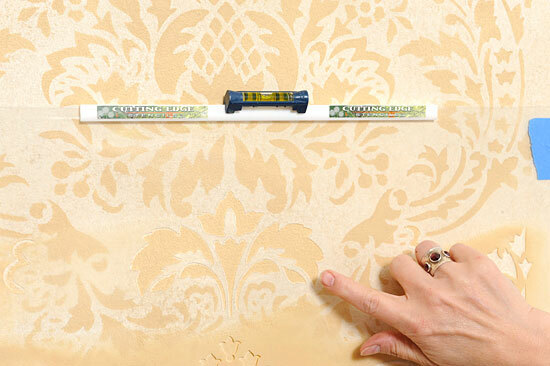 Simply place couple pieces of tape at the baseboard line and roll the stencil right into the edge. Here there is no need for a stencil brush, as you see the result is quite good. 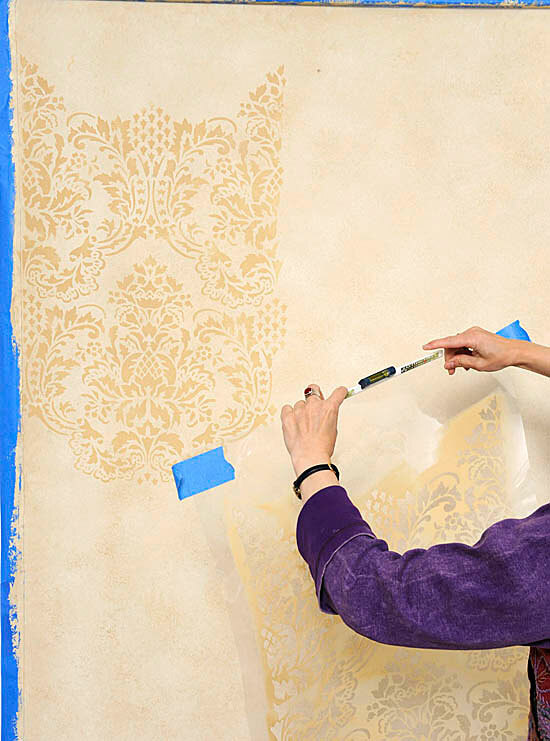 If you need a tighter look, then hit the crease with a stencil brush to get all the stencil detail inside the crease. Don’t press to hard on the roller though, you might get seepage! Here’s the finished edge, looks pretty good to me! It’s done with a just a roller, no brushes. 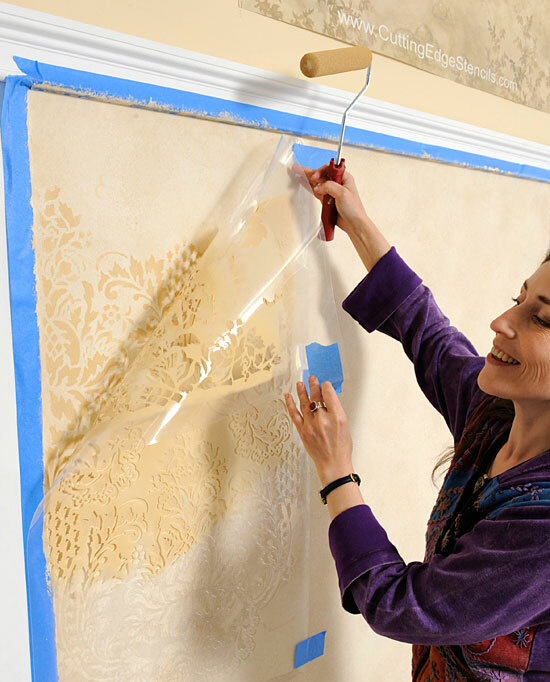 If you need to take a break from stenciling in the middle of the project, just cover your paint tray with plastic wrap, and tightly wrap a piece of plastic or foil around the roller to prevent the paint from drying out. What to do if the stencil repeat doesn’t quite line up? First of all, it’s no big deal, it does happen quite often with allover stencils – every pro will tell you that, and most importantly it doesn’t ruin your project at all. The walls in our homes are mostly not perfect. So no matter how precisely we cut that stencil and how accurately you aligned it, a small discrepancy here and there will occur from time to time. What to do? Just what every pro would do: cheat a little, or “fudge”. Align the stencil as best as you can, level it as best as you can and roll away. Your (or anyone else’s) eye will never notice the discrepancy in the end, just make sure not to re-roll the previously stenciled parts or you’ll get an unsightly double-print. Usually in the next row the discrepancy fixes itself, but in any case you will never notice it later. The only time you might get in trouble if you’re not leveling your stencil at all, and it gradually get’s more and more skewed with each row. So please level your stencil once every few repeats, with the clip-on level it’s virtually effortless. Don’t forget that you’re creating a “hand-painted wall finish”, and little imperfections are natural and inevitable for this type of work. Eventually the stencil will accumulate too much paint and you’ll need to clean it. 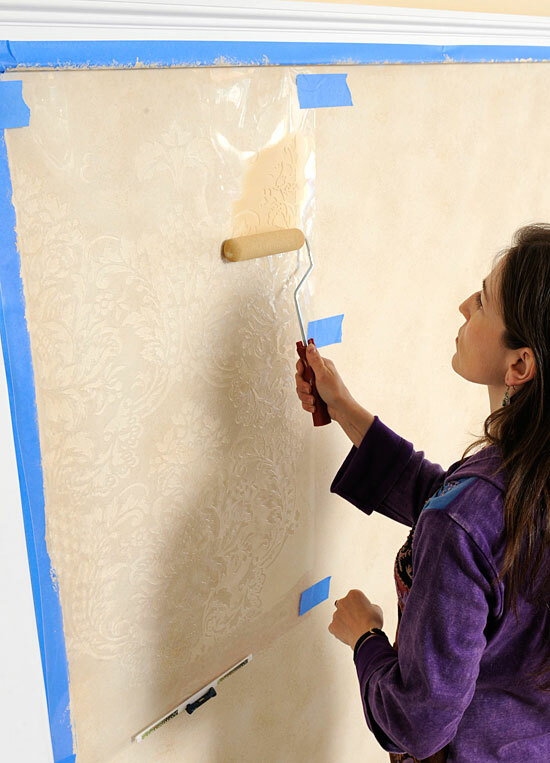 Hopefully you’ll not have to stop in the middle of the project to do this, one stencil should hopefully last without cleaning through an Accent wall project. Cleaning is done by placing a stencil on a flat surface (baking tray, cutting board) and washing it under running water with a stiff-bristled scrubbing brush. A brief soaking or moistening the stencil before this step will help to loosen the paint. Next, let’s talk about finishing the top edges and corners! Stay tuned! 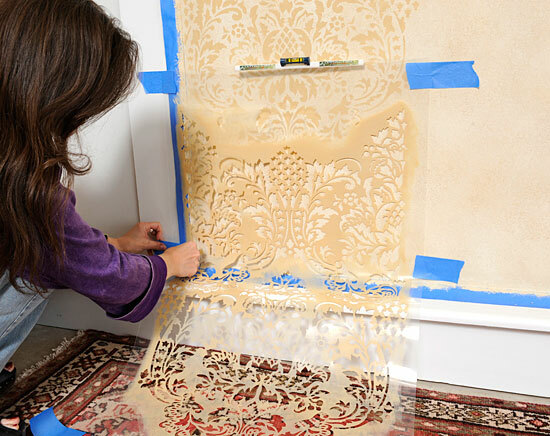 Customize your Curtains with Stencils! Right stencil tools for the right job!